"I'm 87 years old, why did you wait so long to bring me here?" 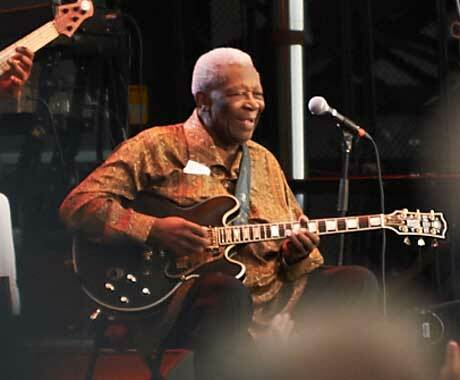 A rare example of a genuine blues act playing the Ottawa Bluesfest, the legendary B.B. King greeted the audience with his archetypal brand of Southern charm. Attracting one of the largest crowds in the festival's 20-year history, King entered the stage 15 minutes after his seven-piece band began warming up onlookers with a tight set of instrumental Delta blues. Seated with his iconic Lucille on his lap, King chatted up the masses before delivering a tranquil rendition of his 1964 single, "Rock Me Baby." Justifiably struggling with his guitar playing, King ambled through "Every Day I Have the Blues," "Guess Who" and "The Thrill is Gone," adding brief and warbled guitar licks while his band proceeded to hold down each song's smooth rhythm. As the show closed with an extended version of "When the Saints Go Marching In," King began to speak boundlessly to select members of the crowd, offering jokes and anecdotes that only those in the first few rows could appreciate. Though B.B. 's live show moved at a senior citizen's pace, the King of Blues gave Ottawa a performance that was nothing less than sincere, passionate and straight from the heart. B.B. King's Children Challenge Will, Accuse Manager of "Undue Influence"